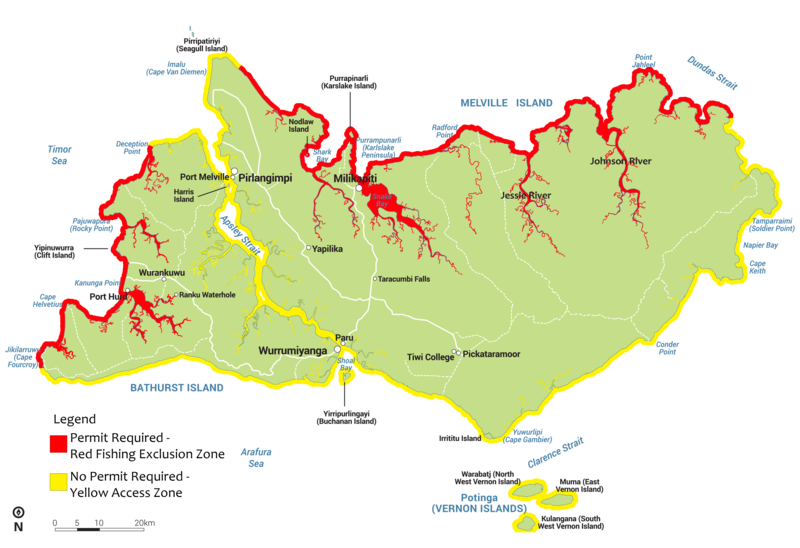 Intertidal waters marked yellow on the map do not require a Fishing Permit however, the Tiwi Islands are private property and fishers can only go ashore with a Visitor Permit. Fishers can apply to stay at three designated campsites â€“ Camp Point and Robertson Creek on Melville Island, and Shaggy's (Tinkanrow) on Bathurst Island. Apply for a Camping Permit here. 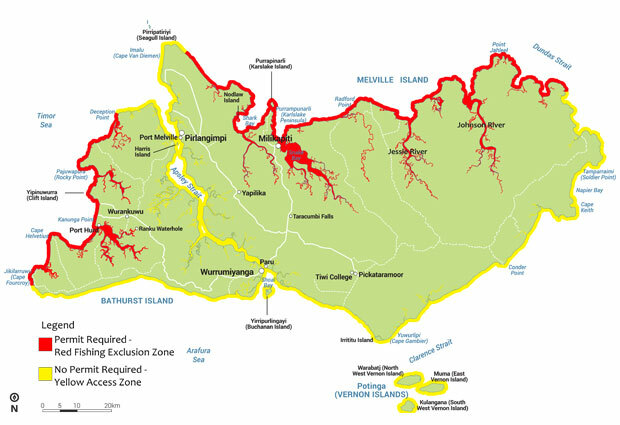 Permits to fish in the Exclusion Zone, marked red on the map, are only issued to permanent non-Tiwi residents and their approved guests on application. Annual Exclusion Zone Fishing Permits cost $200 and expire 12 months from the date of issue. Non-Tiwi visitors can apply for a $100 14-day Fishing Permit if their Tiwi host already holds a valid permit. Revenue from fishing permits is used to protect Tiwi fish stocks and ensure the future of recreational fishing. The Tiwi Land Council requires a minimum of 15 working days to process Fishing Permit applications. Permits must be carried at all times when fishing in the Exclusion Zone of the Tiwi Islands. Click here to apply for a fishing permit.